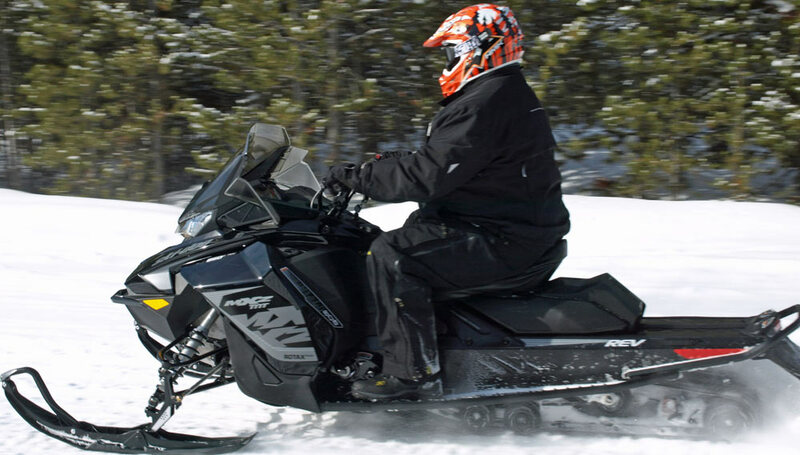 Spoiled as we are, what with hands-on availability of all the best versions of the latest GEN-4 850 E-TEC Ski-Doo MXZ models like the XR-S and MXZ X, we gladly report that the in-season “everyday” 2018 MXZ TNT 850 scores high on our report cards. Yeah, it’s minus the extras and pricier shocks, track options and such that help make the two top-of-the-line 850 REVs stand out, but the “basic” 850 REV, the MXZ TNT 850, does not disappoint at all. With a year’s worth of tweaking the all-new chassis and drive system, all of Ski-Doo’s GEN-4/850 models hit 2018 nicely improved and, in our mind, much more trail worthy. That first-year version left us a bit underwhelmed as we came away from our rides a tad confused as to what Ski-Doo was trying to do. The all-new 850cc Rotax two-stroke twin hit hard from just north of mid-range throttle thanks to its unique booster injectors on the 2017 models, but it seemed a bit harsh for everyday riding. On the X-RS and X models that are supposed to be overtly aggressive, we thought that aggression a bit much for the TNT rider, who might not always be in the “mood” for that much of a hard hit. Tuning we’ve noticed has been stepped back a bit with the 2018 TNT 850, making it exceptionally trail-able for spirited rides with the go-fast guys and equally amenable for riding sweep on a slower paced weekend group ride. The performance remains, it just doesn’t wrench your arms as harshly now. 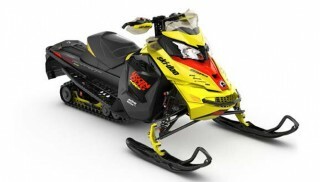 Regardless of which Gen-4 850 MXZ you decide to purchase, they all share the new body styling, which pieces together reflections of Ski-Doo’s past. Plus, you can opt for a TNT 850 in primary white with black trim or a totally black theme. One of the things we immediately liked when we test rode the first 2017 850 Revs literally centered on the engine placement and the impact it made on cornering. That new Gen-4 chassis aligns the drive system of engine and clutches exactly where it works best, centered from side to side and placed low and balanced. With the old set-up, you can feel how the engine sits a bit off-center and sense it when cornering. The Gen-4’s balance is equal side-to-side so you can maneuver more quickly and precisely through the corners, turn after turn. With the 850’s excellent low-end grunt to pull you off the corner, this sled makes you a better rider. We’d be lying if we didn’t admit that the base 850 TNT won’t give you the superior handling of the X and X-RS. You could always upgrade from the TNT’s satisfactory aluminum-bodied HPG Plus shocks to the KYB shocks of the X-RS, but for that extra money you’d be better off just going for the X-RS package. No, for about $2,000 less the TNT 850 satisfies the needs of the everyday sport rider. Handling is very good, even without the top of the line shocks. The ride is comfortable with the base rMotion rear suspension offering supple action through nearly 11 inches of rear travel. The RAS3 front suspension gives you ample travel that is supplemented with coil-over-shock assistance. This front-end design adds one-inch greater stroke while weighing in nearly a pound less than the RAS2 predecessor design. 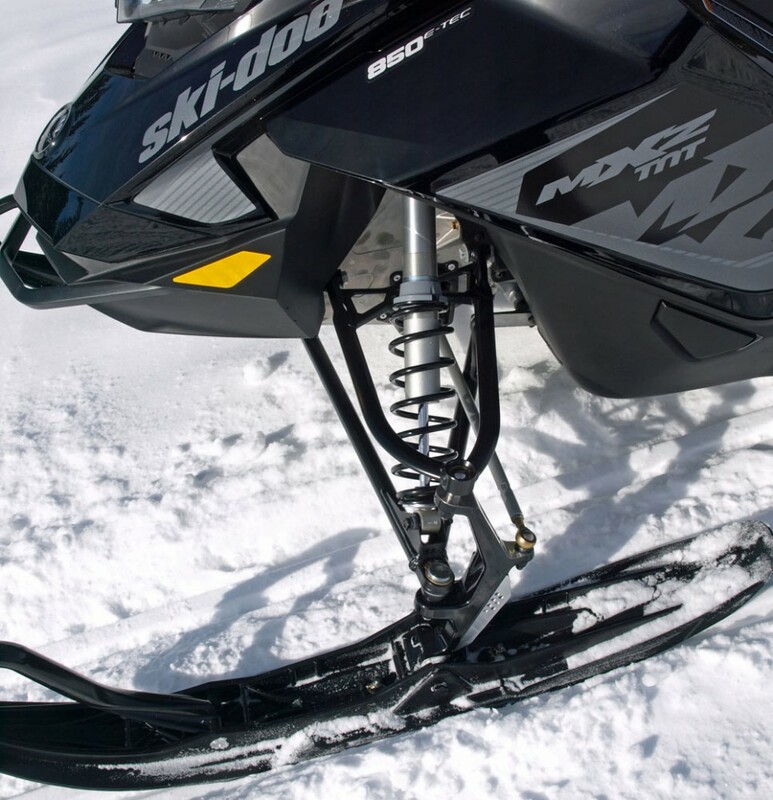 Ski-Doo updated the 850 TNT front suspension to the RAS3, which gives you ample travel supplemented with coil-over-shock assistance. This front-end design adds one-inch greater stroke while coming in nearly a pound less than the RAS2 predecessor design. You’ll find a 129-inch long Ripsaw rubber track with 1.25 lug profile girdling the rMotion rear suspension. Designed to be easily and quickly tuned for changes on the trail, the rMotion handles those small, annoying stutters as easily as its breaks a move on those “G” force suspension suckers. The TNT 850’s ride and handling proves efficient and adaptable for any variety of trail conditions you’ll ride on a given weekend. As the base sport REV with the new big 850 twin, this TNT could benefit from our new favorite handlebar appliance, the forward adjustable riser that comes standard on select MXZ models. 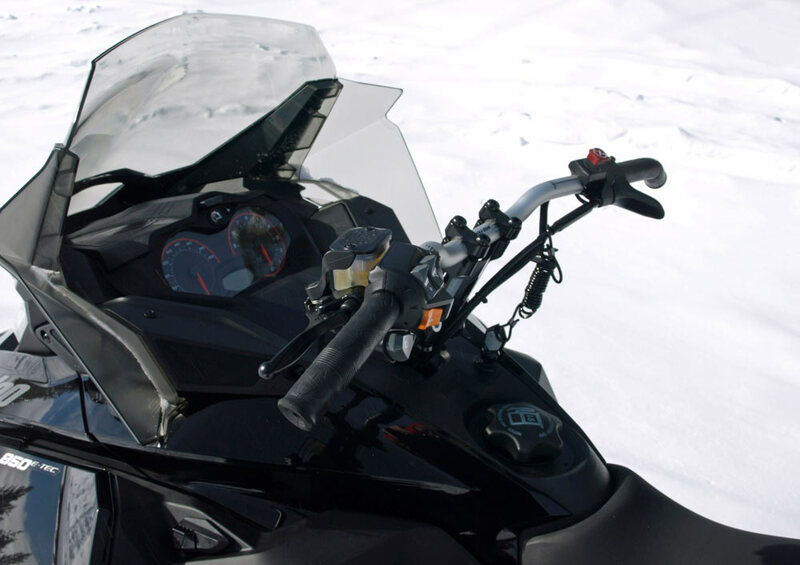 No worries, though, as the TNT’s base handlebar is the go-to adjustment setting for those sleds with the forward adjustable handlebar set-up. The adjustable riser’s benefit is that you can put it in a far forward position for truly aggressive riding and a more upright angle for stand-up moves through the whoops. You’ll find a 129-inch long Ripsaw rubber track with 1.25 lug profile girdling the rMotion rear suspension. Equipped with the trail performance seat, the saddle offers ample cushioning and ease of motion for side to side maneuvering or sit back cruising. 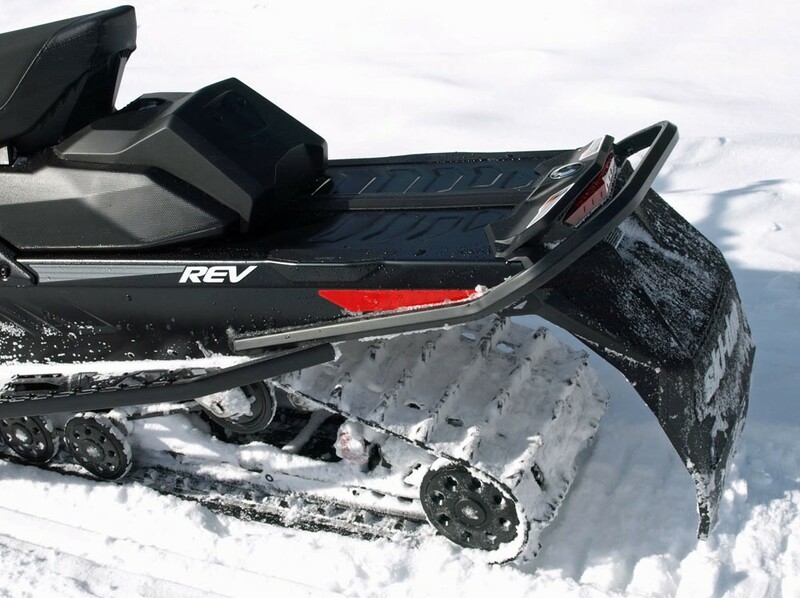 As this is a REV, the sled that redefined how we ride, you can easily pop up to challenge a rough section or slip forward for better balance though a series of S-curves and sweepers. As anyone who has read a previous REV Gen-4 review of ours, we are not fans of the “open” foot well, but with the optional adjustable foot and toe holds, the riding position works just fine. Although our favorite REV 850 is this year’s MXZ X-RS 850, we remain impressed with the value offered in the “base” TNT 850. Handling and ride are very good. The shock and spring settings reflect a compromise compared to the outright “racer” favored set up of the X and X-RS. 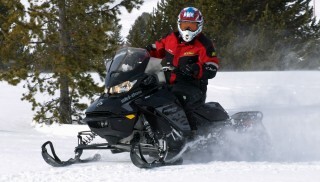 Ski-Doo moves that compromise more toward the aggressive side and away from an overly soft one. There is plenty of sport riding available to TNT 850 buyers. Although the forward adjustable handlebar option would be nice to have, the basic TNT rider’s handlebar setup works well thanks to the thin aluminum bar with the curved ends. 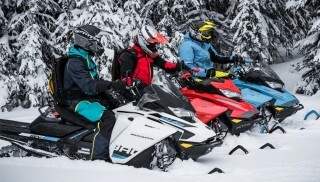 Regardless of which Gen-4 850 MXZ you decide to purchase, they all share the new body styling, which pieces together reflections of Ski-Doo’s past. Plus, you can opt for a primary white with black trim or a totally black paint scheme. We prefer the all-black look as it blends nicely into the 17-inch windscreen. 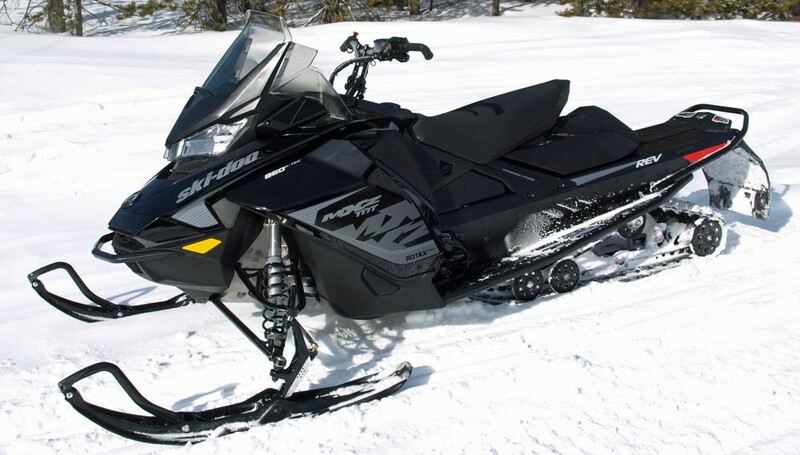 To make this sled look meaner and more visible to oncoming riders, you can dress it up with auxiliary LED lighting. To gain more utility, you can exploit the LinQ onboard storage system and add tunnel bags, touring gear, racks and even a fuel caddy. To make in-the-saddle onboard suspension adjustments, there is an optional remote activated adjustable coupler block system. As a trail cruiser, the latest MXZ TNT 850 benefited from a season of tweaking, making it even more powerfully pleasant for everyday excursions. Optional features turn the TNT 850 into your personal on-trail statement, but even as a no-frills base sled from a dealership, this Ski-Doo provides a just right mix of trail-ready features that ensure positive and precise handling, above average ride, exemplary styling and strong, and we do mean strong, low end grunt that carries up to triple digit top end. The base MXZ TNT 850 is “base” only in the sense that it will be compared to MXZ X-RS and X versions, which for model year 2018 are truly outstanding renditions of this latest generation of REV snowmobiles. We found the 2018 TNT 850 superbly suited for everyday riding and easily recommended as a best buy for trail sport riders.